or contact our service team. For more detail on how we can keep your generator in reliable, contact our service team. A generator system that draws its diesel fuel from a stationary tank is prone to deterioration of the fuel and the fuel system. Poor fuel affects emissions, engine life, engine oil, fuel lines, fuel pumps, etc, and in turn reduces the life and reliability of a generator system. 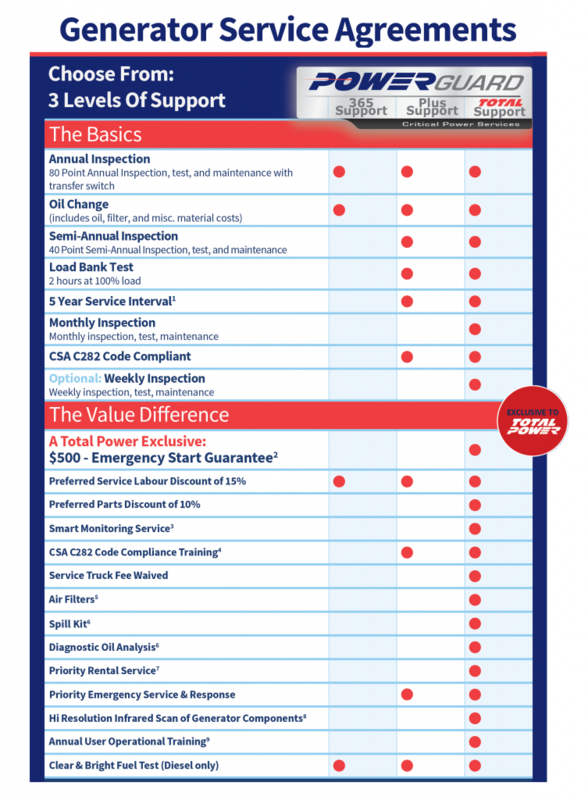 Total Power’s PowerGuard Services provides fuel cleaning and analysis, TSSA certified fuel tank replacement and fuel system upgrades with 100% TSSA approval. Our fuel service team that can replace or top up your fuel tank at very competitive rates. Check out our other Fuel Services. An annual two hour load bank test is required by CSA C282 and is the best way to ensure all emergency power systems perform properly when needed most. This test is designed to run your generator at 100% load for a minimum of 2 hours in order to reveal potential failures and to increase system reliability. Our emergency service is available 7 days a week, 24 hours a day. After business hours, our on call representatives will have a technician respond to your needs in an expedient manner. If your system is beyond repair, we can provide you with a temporary rental set until your unit is replaced. When you call Total Power in the event of an emergency, for trouble-shooting, or repair, the entire team at Total Power team works collaboratively to solve your problem without delay. Having large inventories of parts and a diverse geographical coverage in three provinces, parts are delivered and technicians are quickly dispatched to ensure your equipment is back in service as soon as possible.